BERKELEY, CA — As structures made of metal get smaller — as their dimensions approach the micrometer scale (millionths of a meter) or less — they get stronger. Scientists discovered this phenomenon 50 years ago while measuring the strength of tin "whiskers" a few micrometers in diameter and a few millimeters in length. Many theories have been proposed to explain why smaller is stronger, but only recently has it become possible to see and record what's actually happening in tiny structures under stress. Compression of a nickel pillar whose free end has a diameter of about 150 nanometers. Before compression (left) the pillar has a high density of defects, visible as dark mottling. After compression all the defects have been driven out, a previously unobserved process known as "mechanical annealing." Andrew Minor, of the Materials Sciences Division in the Department of Energy's Lawrence Berkeley National Laboratory, with colleagues from Hysitron Incorporated and the General Motors Research and Development Center, used the In Situ Microscope at the National Center for Electron Microscopy (NCEM) to record what happens when pillars of nickel with diameters between 150 and 400 nanometers (billionths of a meter) are compressed under a flat punch made of diamond. The transmission electron microscope is equipped so that samples can be stressed, measured, and videotaped while being observed under the electron beam. "What controls the deformation of a metal object is the way that defects, called dislocations, move along planes in its crystal structure," Minor says. "The result of dislocation slip is plastic deformation. For example, bending a paper clip causes its trillions of dislocations per square centimeter to tangle up and multiply as they run into one another and slide along numerous slip planes." Minor says, "The first thing we observed was that, before the test, the nanoscale pillars of nickel were full of dislocations. But as we compressed the pillar, all the dislocations were driven out of the material — literally reducing the dislocation density by 15 orders of magnitude and producing a perfect crystal. We called this effect mechanical annealing." The pillars Minor and his colleagues tested were machined from pure nickel using a focused ion beam (FIB), a new technique for small-scale mechanical-compression testing first described in 2004 by Michael Uchic of the U.S. Air Force Research Laboratory and his colleagues. 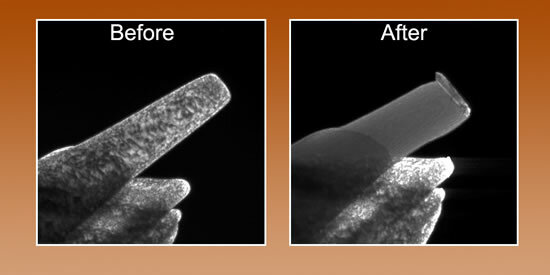 The FIB technique makes it possible to create much smaller structures than the metal "whiskers" first studied in the 1950s, which are made by growing crystals. Some of the dislocations the researchers observed in the machined pillars were relatively shallow and caused by the ion beams themselves. Others extended through the crystal and were presumably pre-existing defects. Under compression, mechanical annealing caused both kinds of defect to vanish. "Essentially all the dislocations escape from the crystal at the surface, and you do not get storage of dislocations like you would in larger crystals," Minor says. "What results is a process called 'dislocation starvation,' recently proposed by William D. Nix of Stanford, among others, which has quickly became one of the leading theories of why smaller structures are stronger." Minor explains, "The idea is that if dislocations escape the material before they can interact and multiply, there are not enough active dislocations to enable the imposed deformation. The structure can only deform after new dislocations are created." This is precisely the process he and his colleagues observed with NCEM's In Situ Microscope, strong evidence that "dislocation starvation" is the correct explanation for the increased strength of small structures. What happens if a defect-free nanoscale nickel pillar continues to be compressed? Something has to give, which happens when new sources of dislocation "nucleate" in the material. As the existing dislocations disappear in the pillar because of mechanical annealing, the nucleation of new dislocation sources happens at progressively higher stresses. In the pillar structures, plastic deformation may take the form of sudden flattening, bulging, twisting, or shearing of the pillar, as bursts of new dislocations propagate through it. Or the hardened pillars, made stronger by mechanical annealing, may punch right down into the substrate — even though pillar and substrate are the same continuous piece of metal. Both processes were captured in the In Situ Microscope's dramatic videotaped experiments. 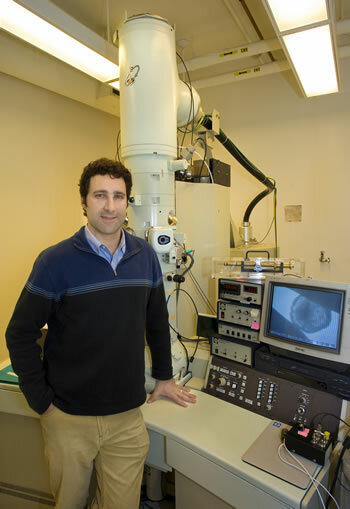 Andrew Minor with the In Situ Microscope at the National Center for Electron Microscopy. The FIB machining used by the NCEM researchers produced nickel pillars that were slightly tapered, and the researchers noted that this geometry affected where and how plastic deformation occurred, generally being greater in the smaller-diameter, free end (top) of the pillar. In larger pillars, those approaching 300 nanometers in diameter, mechanical annealing was not complete, and some dislocations remained visible even after compression. Yet even these pillars exhibited enhanced strength, and progressively higher stresses were needed to continue deformation — underlining the point that it is the creation of mobile defects that determines strength in these small volumes. "The beauty of the pillar-testing geometry is that we can straightforwardly define stress. Then we can correlate the measured stresses with discrete plastic events recorded in situ and more clearly interpret the quantitative data from our experiments," says Minor. "The debate over what determines the strength of a small structure has come down to almost a chicken-and-egg question — is something strong because you need a high stress to move a dislocation that is already there? Or is it strong because you need a high stress to nucleate a new dislocation? In this case, it seems that source nucleation — that is, the 'egg' — is the determining factor." "Mechanical annealing and source-limited deformation in submicrometre-diameter Ni crystals," by Z.W. Shan, Raj Mishra, S.A. Syed Asif, Oden L. Warren, and Andrew M. Minor, appears in the January, 2008 issue of Nature Materials, advance online publication 23 December, 2007 at http://www.nature.com/nmat/journal/vaop/ncurrent/full/nmat2085.html. This work was partially supported by a grant from the US Department of Energy to Hysitron, Inc., and also by a grant from the DOE Office of Science, Office of Basic Energy Sciences.